You are browsing the archive for Newsletter. The next International Conference on Urban Climate (ICUC-11) will take place in Sydney, Australia from August 30 to September 3, 2021. The Board of the International Association for Urban Climate (IAUC) selected the team in Sydney with its proposal “Cities as Living Labs: Climate, Vulnerability, and Multidisciplinary Solutions“ on April 4, 2019. The Board’s decision follows the results of a membership consultation in March. In the membership consultation, a strong preference for Sydd ney emerged. From a total of 240 voters, 64% ranked Sydney their first choice, followed by 19% that ranked “Hong Kong” first and 17% that ranked “Beijing” first. 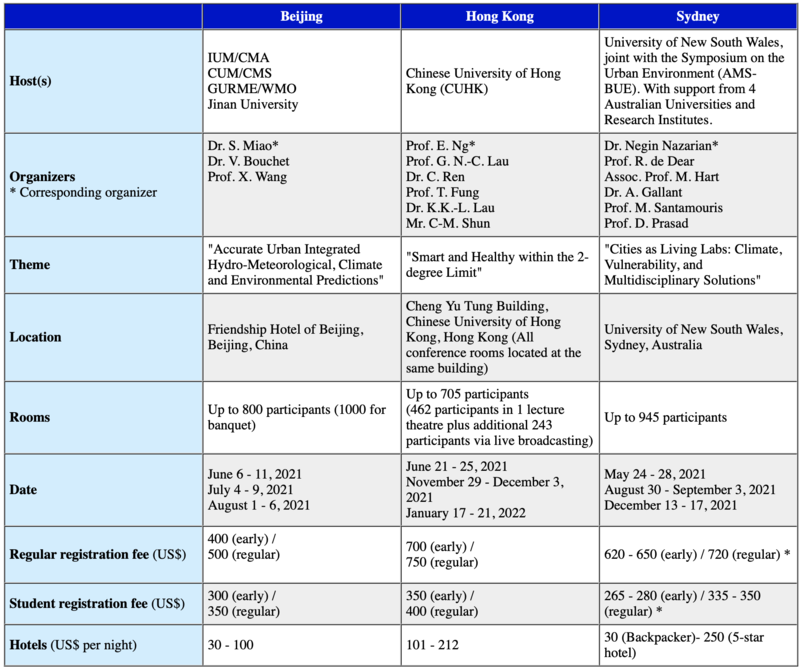 The University of New South Wales (UNSW) who will host ICUC-11 has also received support from the American Meteorological Society (AMS) Board on the Urban Environment (BUE) to run ICUC-11 together with the Symposium on the Urban Environment (AMS-BUE). UNSW will collaborate with other Australian Universities and Research Institutes in hosting this conference. The next International Conference on Urban Climate (ICUC-11) will take place in Sydney, Australia between August 30 and September 3, 2021. All active IAUC members have received a personal link per email to a survey where they can indicate their preferences about the location and timing of the next International Conference on Urban Climate (ICUC-11) in 2021 / 2022. The IAUC board thanks the candidate teams for preparing proposals to host ICUC-11. We thank everyone for participating in the survey and sharing their preferences and vote. The survey closes Monday, March 25, 23:59 CET. We received six nominations for the two Board positions for the term 2019 – 2022. Therefore, we will hold an election. All members of the International Association for Urban Climate (IAUC) registered on this site by November 6, 2018 are eligible to vote for up to two candidates in the election. Please follow your personal, single-use link sent to you by email. The election closes on December 26, 2018, 23:59 UTC. IC2UHI 2019 organizing team reminds you that the abstracts submission deadline is approaching. You still have 10 days for the submission of your abstract(s). The Fifth International Conference on Countermeasures to Urban Heat Islands (IC2UHI), will be devoted to the science, engineering and public policies to help relieve the excess heat and air pollution in urban environments. It has long been recognized that the excessive heat and smog in many cities, the “Urban Heat Island” (UHI), is partly due to the choices of building materials, vegetation and urban design. Scientists, engineers, builders, architects, and government officials concerned with improving the urban environment are urged to participate in the 5th IC2UHI. It is proposed to publish accepted papers in electronic conference proceedings with Elsevier and selected papers in Energy and Buildings Journal Special Issue: Countering urban Heat Island (UHI) and Climate Change Through Mitigation and Adaptation. The June 2018 issue of the Urban Climate News is now available! Please join me in welcoming our new Board Executive: President-Elect, Nigel Tapper (Monash University, Australia) and Secretary-Elect Andreas Christen (University of Freiburg, Germany). Nigel is a current member of the IAUC Board completing a 4 year term as an elected Board Member. Andreas rejoins the Board after serving a 4 year term as an elected Board member from 2012-2016. They will begin their 4 year terms in August at the time of ICUC-10. Thanks to Secretary David Sailor and Past-Secretary Rohinton Emmanuel for their help in running the search and election process on behalf of the Board. The December 2017 issue of the Urban Climate News (Issue 66) is now available. On behalf of Editor David Pearlmutter and the entire UCN Team, Happy 2018! The deadline for abstracts submission for the 10th International Conference on Urban Climate/14th Symposium on the Urban Environment (ICUC10) has been extended to January 2, 2018. The conference will be held in New York City, 6 – 10 August 2018. There is NO FEE to submit an abstract! Detailed information, the call for papers and the link to the abstract submission portal are all available on the conference webpage. Note to students from developing countries: We have secured financial assistance for limited travel support for students from developing countries in need of travel assistance. We encourage these students to submit their abstracts and request travel assistance in the abstract submission form. 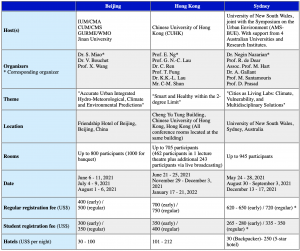 Travel awards will be granted after the abstract acceptance time. Note to colleagues from countries banned from entering US: We encourage citizens from countries currently banned from entering the US to also submit an Abstract before the deadline. The Organizers are working to accommodate their research into the conference.